What is the right cloud for your business? Private vs Public vs Hybrid vs Multi-Cloud? How do you realise the ‘art of the possible’ to get the most out of what’s available whilst managing risk and the impact to IT and the wider business? How do you truly drive innovation and digital transformation for your business? From experience we know that if you follow a structured process you will get success from the cloud. But in reality what does this process look like? And what types of challenges and benefits are you likely to meet along the way? 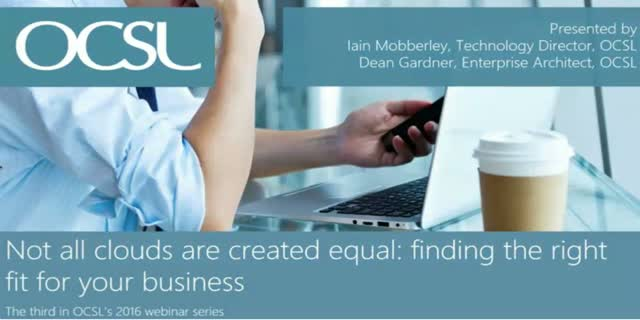 Attend our 30 minute webinar to hear a cross section of views – from our Technology Director who regularly discusses strategy and business drivers at C-Suite level, one of our leading Enterprise Architects who takes customers along this process from beginning to end and one of our customers who has recently completed this process. The analysts are now talking about the next phase or decade of cloud, about how it will drive innovations such as IoT, 3D printing and smart machines. But if you don't get the foundations right now, how will you achieve success from these in the future? Hear insights to help you create the right foundations for your business to meet these demands head on.